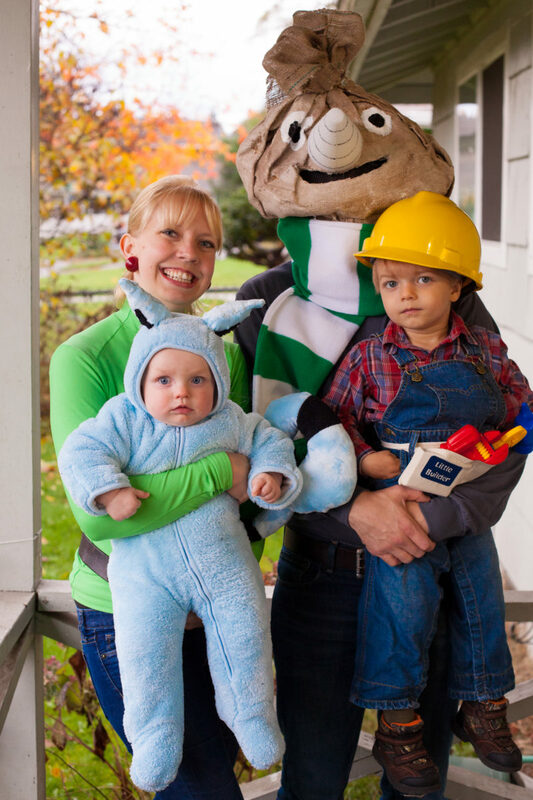 CHECK OUT HOW WE MADE OUR DIY BOB THE BUILDER HALLOWEEN COSTUME FOR THE WHOLE FAMILY! Hi friends! 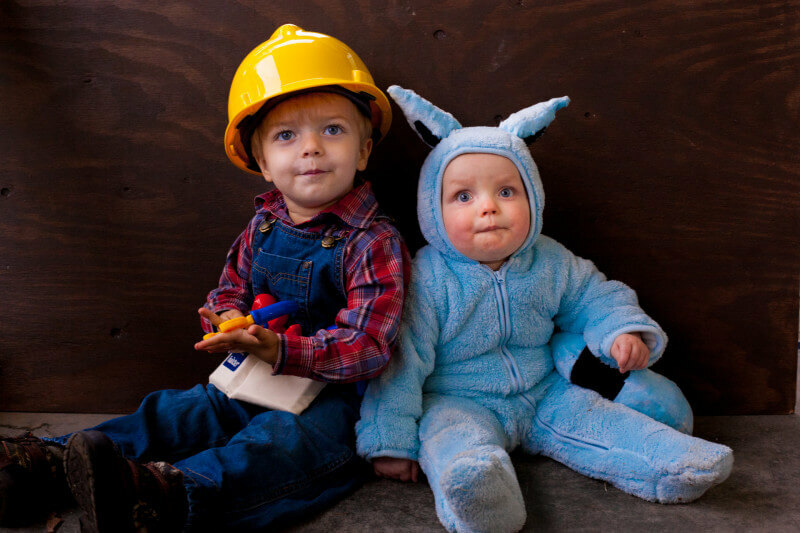 We hope your Halloween was as fun as ours was. 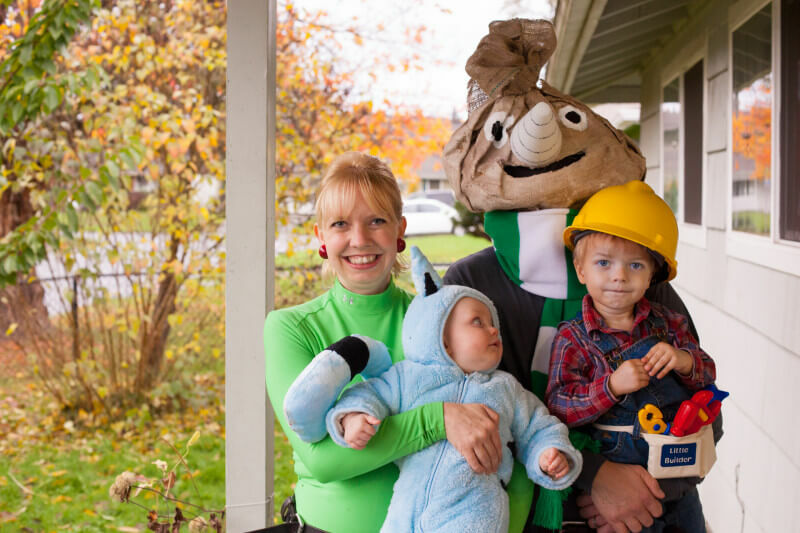 We went to a party with our Life Group, then the kids trick-or-treated a little around that neighborhood. After that we popped by to surprise Grammie. It was a blast! I have been imagining our costumes for about 6 months, and collecting the pieces throughout the year, but only had a couple days to make them once we got back from Mexico. It was actually pretty easy so I’ll be writing up a tutorial here in case anyone else wants to do a Spud or Pilchard costume, which definitely took the most work. Speaking of work…I’m trying to blog EVERY day this month for NaBloPoMo, or National Blog Posting Month. Am I crazy? But I was really inspired at Food Blog University and want to push myself to share more with you here. SO, I’m diving right in! Not every post this month will be a recipe. I only work about 10-15 hours a week so there’s no way I can do 30 recipe posts in a month! So I plan to have some fun peeks behind the scenes of food photography, some family stories, and a few surprises. Speaking of Food Blog University, I have a million pictures and stories to share with you, and am working on a couple videos, so stay tuned. For now, come back tomorrow for the first new surprise at Eating Richly Even When You’re Broke. Here’s a sneak peek!